The Quick Search feature is a single-text-box query tool. 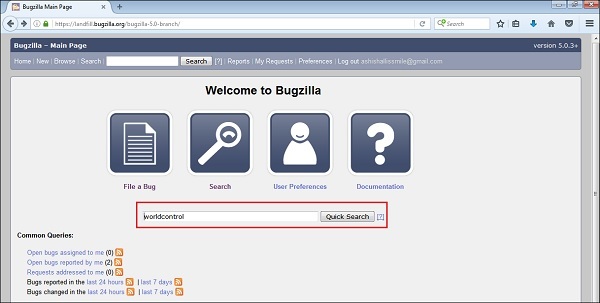 It is available on the Bugzilla home page as shown in the screenshot below. The Quick Search feature uses Meta characters to indicate what is to be searched. For example, typing bug|login into Quick Search would search for "bug" or "login" in the summary and whiteboard of a bug. The user can also use it to go directly to a bug by entering its number or its alias. By clicking on the Quick Search button, it displays list of bugs as shown in the screenshot below.